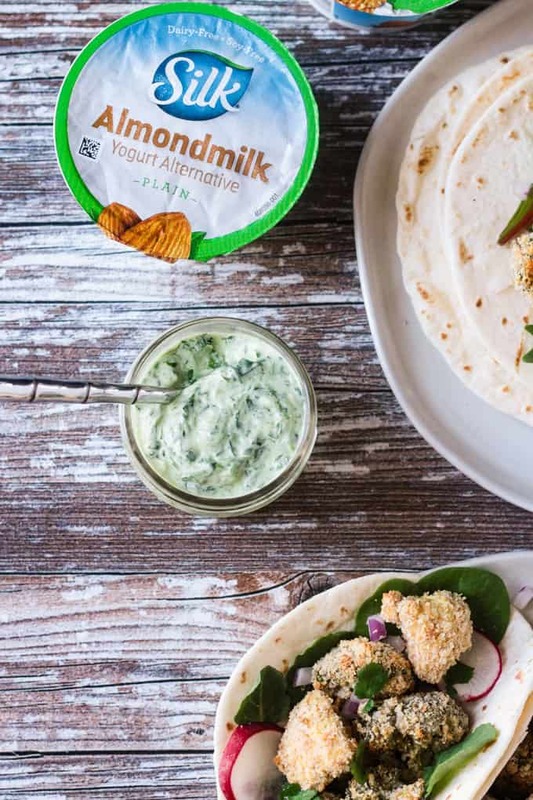 Crunchy Veggie Tacos with a creamy cilantro yogurt sauce – Make vegetables the star of your plate in a new delicious way that the whole family will love. Easy enough for a weeknight dinner. How do you get the whole family to eat their veggies? Coat them in crunchy breading and stuff them in a taco! 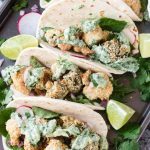 Everyone loves crispy crunchy breading and everyone loves tacos, so these Crunchy Veggie Tacos are a win-win. 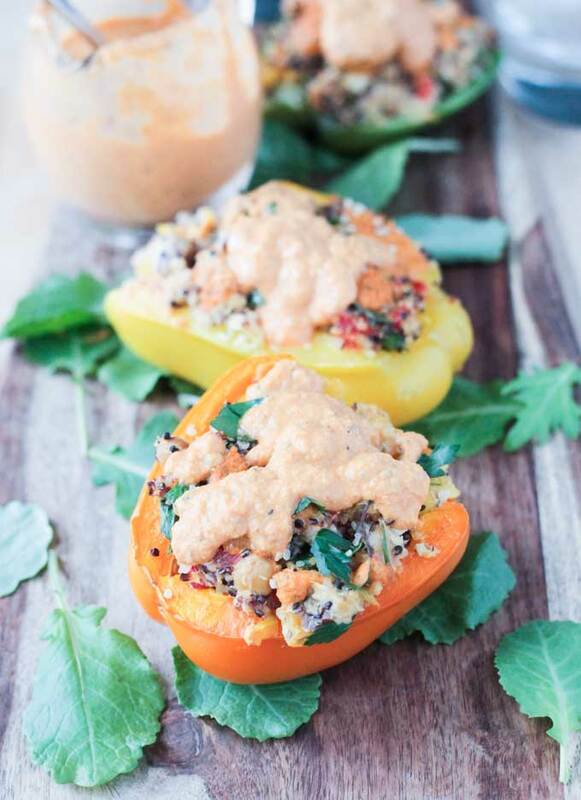 Bonus – they’re paired with a creamy cilantro dairy free yogurt sauce to bring it all together. Plus, they are quick and easy making them perfect for any night of the week. I’ve being using Silk products for years. They are one of the first brands I turned to when I started on my plant based journey. You might remember these uber fluffy Peaches and Cream Pancakes or this Homemade Iced Caramel Macchiato I made using Silk products. Silk is non-GMO, dairy-free AND lactose-free. 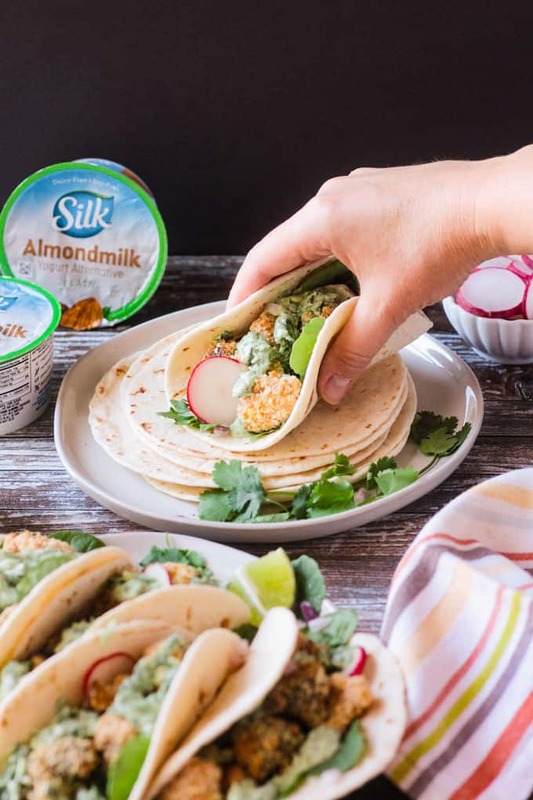 They have a large variety of plant milks, creamers, and yogurt alternatives, making it easy to ditch the dairy while still enjoying your favorite tastes. Silk believes, and I do too, that all-or-nothing is not the only path to being healthier. Progress is Perfection! 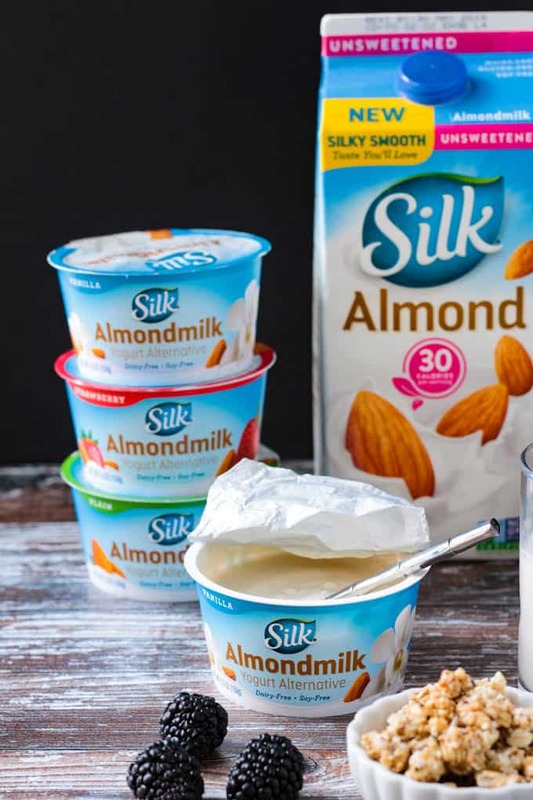 These new Almondmilk Dairy-Free Yogurt Alternatives are smooth and creamy. We love them for breakfast with granola and fruit. They also make a great snack. I particularly love the Plain flavor – it has a touch of sweetness, but it works great in both sweet and savory recipes. 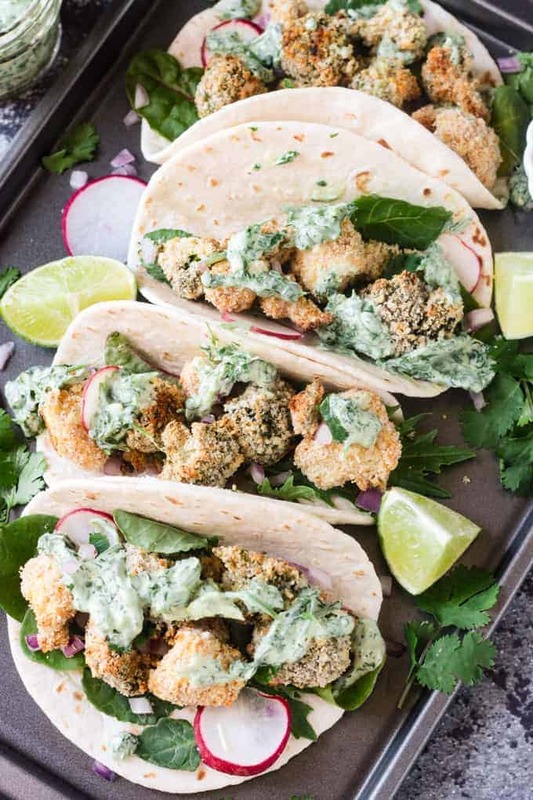 It’s what I used to make these Crunchy Veggie Tacos and the Creamy Cilantro Yogurt Sauce. Silk products are conveniently located at Walmart. 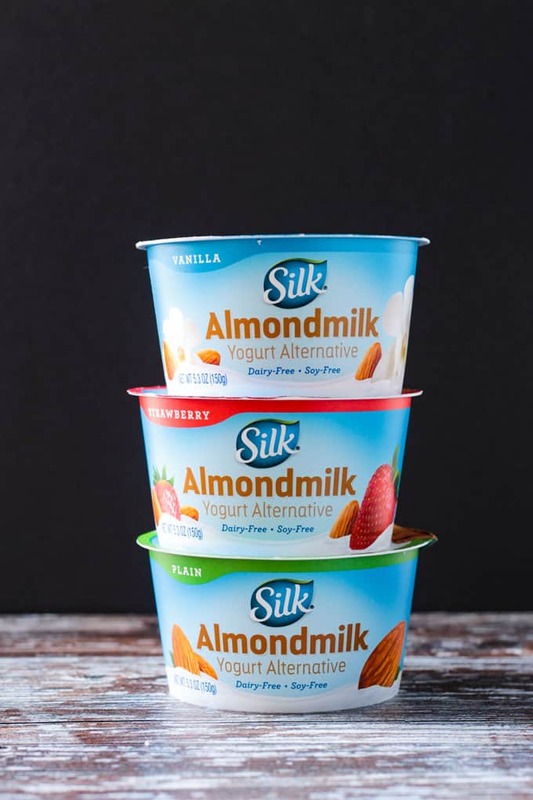 Be sure to download the Ibotta app and grab the coupon below for $.75 off of your next Silk Almondmilk Yogurt Alternative purchase at Walmart. I decided to use the Walmart Grocery Pickup for this order. We had an extremely busy weekend full of swim lessons, baseball practices, and birthday parties. I didn’t want to add grocery shopping to our already full schedule, but we definitely needed some food in the house. Within minutes, I placed my order online and chose a pick-up time that worked for me. 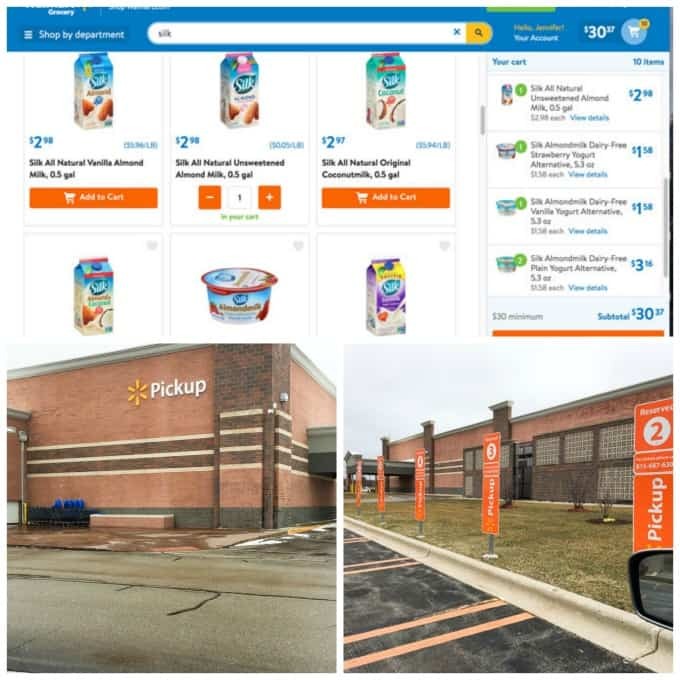 By “checking in” with Walmart Grocery Pickup app when you are on your way – Walmart knows when you arrive and sends an employee out to your car with your order. All you have to do is follow the large orange arrows directing you to the Grocery Pickup parking spots. They will even load it into your car for you if you wish. Bonus: the app alerts you when your order is ready 15 minutes before your chosen pick-up time…which is great if you accidentally forget that you scheduled it (I “might” know this from experience. HaHa!). The day I scheduled my grocery pick up was cold, incredibly windy, and I had both girls with me. It was SO nice to not have to get out of my car. We were loaded up and on our way in just minutes. So convenient!! These delicious veggies are first tossed in an easy batter and then coated with crispy crunchy breadcrumbs. I use a mix of regular and panko breadcrumbs. The regular breadcrumbs are super fine so they help the breading adhere to the battered veggies. 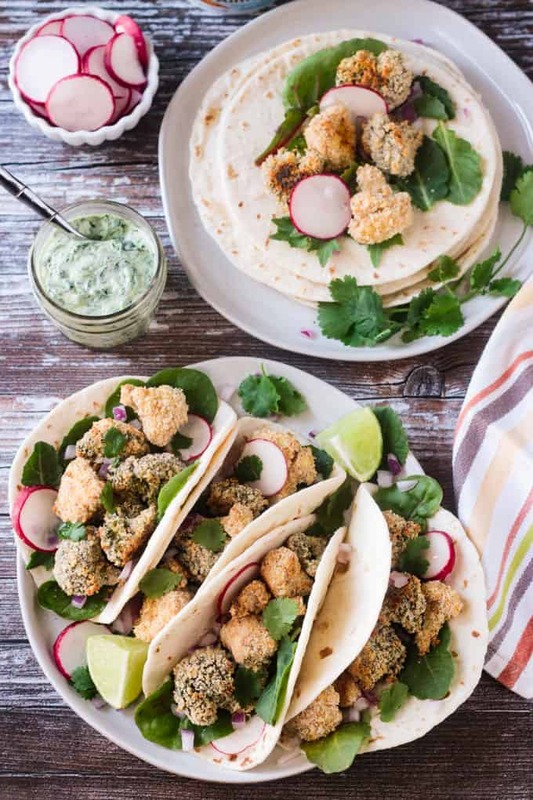 The panko breadcrumbs are super crispy which means amazing crunchy texture for your Crunchy Veggie Tacos! I promise you the breading will stick to the veggies easily, with little to no fuss, turning out perfectly every time! When you’re eating breaded food, you need a creamy sauce to balance the textures. 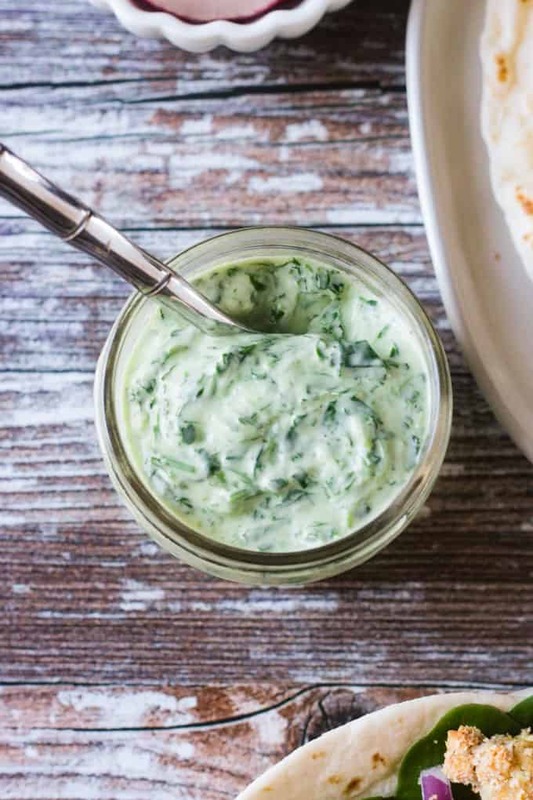 This Cilantro Yogurt Sauce is a delicious compliment to the crunchy broccoli and cauliflower. It’s creamy and garlicky and packed full of cilantro. Parsley would be a great substitution if you’re not a fan of cilantro. Health is hard, but feeling healthier doesn’t have to be. Making small changes to your diet, like loading up on extra vegetables or swapping out the dairy milk in your breakfast cereal for Silk Unsweetened Almondmilk, is one more victory on your path to a better you. For more Progress is Perfection inspiration with Silk, click here. 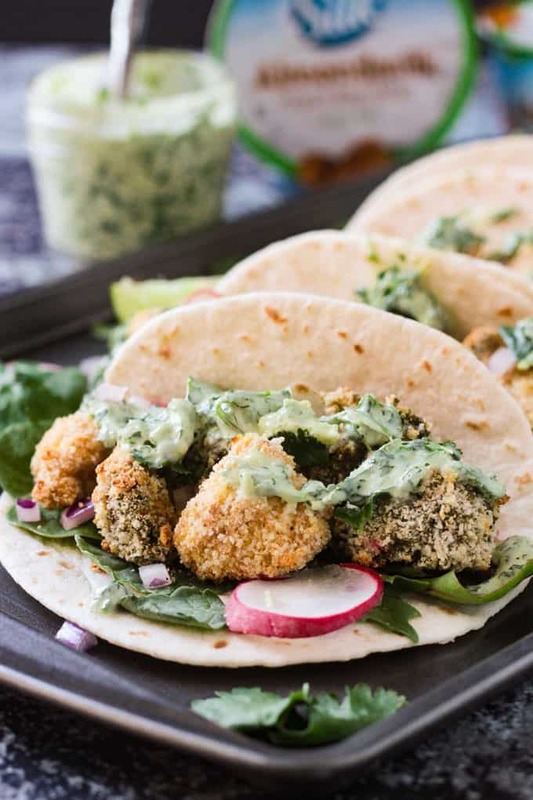 I hope you love these Crunchy Veggie Tacos as much as we do. If you try them please come back and leave me a comment below with your feedback and star rating. You can also find me on social media. Be sure to tag @veggie_inspired and #veggieinspired so I’m sure to see it. 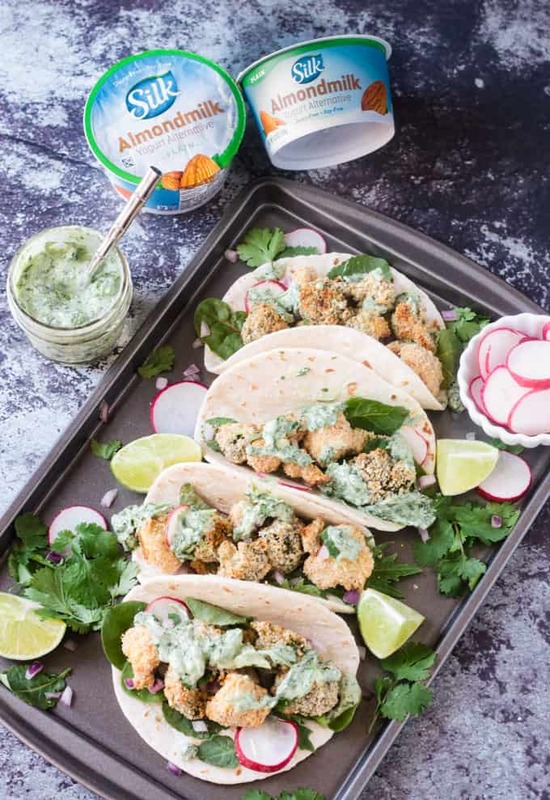 Crunchy Veggie Tacos with a creamy cilantro yogurt sauce - Make vegetables the star of your plate in a new delicious way that the whole family will love. 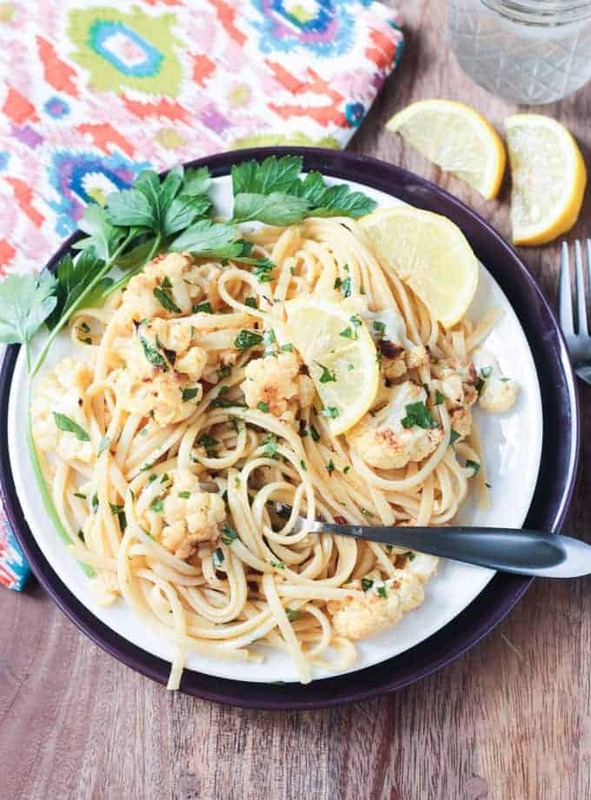 Easy enough for a weeknight dinner. Preheat the oven 350 degrees F. Line a large baking sheet with parchment and set aside. (You may need two baking sheets to fit all of your veggies without overcrowding). In a medium mixing bowl, whisk together the chickpea flour, dairy-free yogurt alternative, water, chili powder, garlic powder, and onion powder until smooth. In another mixing bowl, mix together the regular breadcrumbs and panko breadcrumbs. 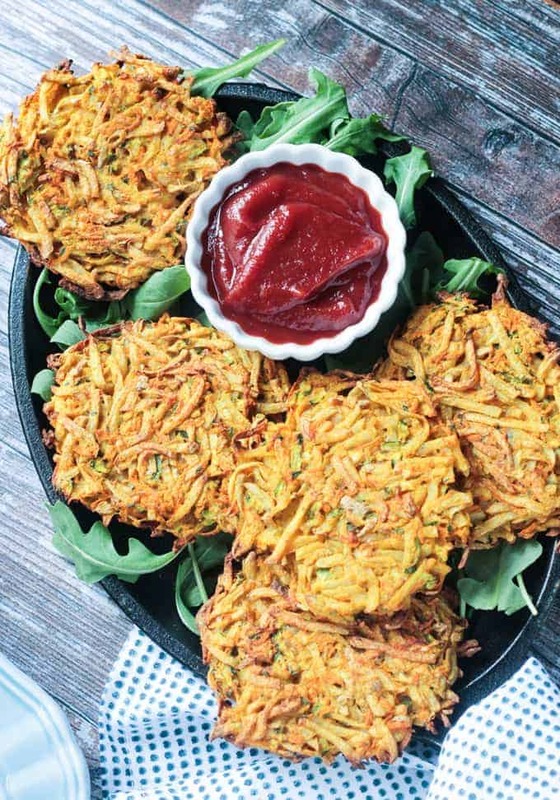 Toss the cauliflower and broccoli florets in the chickpea flour batter and mix well to ensure the vegetables are completely covered. Working in batches, transfer the battered veggies to the bowl of breadcrumbs and toss to coat. I like using two forks to gently toss the veggies so my hands don't get messy. Using the forks, scoop up the breaded veggies and transfer them to the prepared baking sheet(s). Spread the veggies out on the pan in one even layer with plenty of space in between. Do not overcrowd the pan! Bake for 15-20 minutes until the edges are slightly browned and crispy. While the veggies are cooking, make the sauce. In a blender or food processor, add all of the sauce ingredients and pulse several times until blended. You can purée it until smooth if you wish, but I like when the cilantro is still chunky. To serve: fill each tortilla with baby greens or lettuce, top with the crunchy veggies, diced red onion, thinly sliced radishes, and a generous drizzle of the Cilantro Yogurt Sauce. ~Nutrition facts assumes two tacos per serving, including sauce and tortilla. Additional toppings not considered. I’ve actually been on the hunt for a good vegan yogurt to use in recipes! And I love the addition broccoli in your tacos – yum! This one does have a bit of sweetness still…which is ok since I usually balance sauce with a touch of maple syrup…so this one didn’t need it. I do wish they would come out with a truly plain flavor that is unsweetened though for those times when I really want that super tangy flavor. Thanks, Holly! I didn’t realize Silk made a plain almond milk yogurt. Looking forward to checking that out! also, this recipe? OMG! Can’t wait to try it! They’re new! And they’re so good!!! My new fave for sure! Thanks, Marly! We’ve done cauliflower tacos but never broccoli! Just love how it looks and sounds though, especially when paired with that sauce. Thanks, Nicole! My kids LOVE broccoli (yay!) so I’m always thinking of new ways to use it. These tacos look so crispy and delicious. The Silk yogurt is a great idea! Thanks for the recipe. Thank you, Stephanie! I am seriously loving the new almondmilk yogurts! They really taste just like the real thing! Hope you love these tacos!